Are you making one of these rate-setting mistakes? If you aren’t hitting your income goals on a regular basis, it’s probably less because of a failure on your part, and more because the math doesn’t add up. Do not try to do a direct conversion from an employee salary to a 40 hour work week to freelancing hourly rates. If nothing else, freelancers have to pay for taxes, health insurance, and business expenses out of pocket, and employees don’t. If you must try that conversion, multiply the employee hourly by 2-3x to get a more accurate freelancing rate. You also need to account for the fact that you probably only have 15-20 billable hours in a work week. …because spending too much time on client work and not enough time on your own business and your business systems is a huge contributor to the feast or famine cycle. Keep marketing and pitching even when you have a full client docket. (click to tweet) If you don’t have enough time to do that after your client work, you need to raise your rates and drop a client. 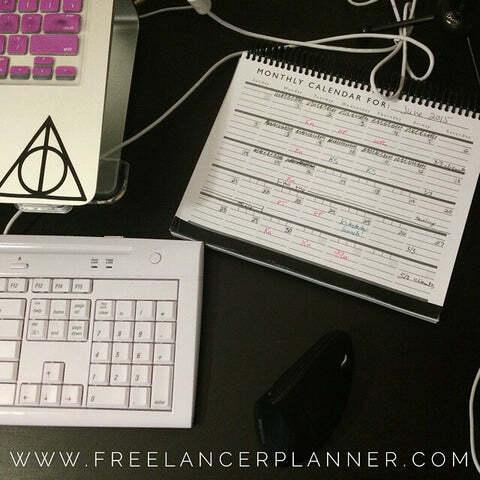 And, if you haven’t taken a look at it yet, make sure to check out the Freelancer Planner Kickstarter – you can back for as little as $1, and you can reserve your planner for $25. There are discounts for buying two or more planners, so you can even go in with a friend or knock out your holiday shopping early! (I know you have at least one productivity nerd or organizationally challenged creative on your shopping list.) If you want to help by spreading the word, you can click here to tweet about it, repin this pin, or share this post (or this image) on Facebook. Thanks in advance – you rock my socks.